Book an Oceanview stateroom or above on this sailing and get special amenities at no extra charge, including an invitation to a private cocktail reception, the services of a Distinctive Voyages host to assist you throughout your cruise and a specially-chosen shore excursion in Curaçao. 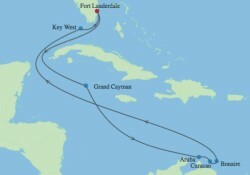 * The Distinctive Voyages host on this sailing will be Bluegreen Travel Services staffer Carolyn Love. Board the sophisticated Celebrity Equinox for a Southern Caribbean cruise that stops at the beautiful ABC islands—Aruba, Bonaire and Curaçao—plus nature-filled Grand Cayman and colorful Key West. And because this is a Distinctive Voyages sailing, you’ll get special amenities at no extra charge when you book an Oceanview stateroom or above, including an invitation to a private cocktail reception, the services of a concierge host to assist you throughout your cruise and a specially-chosen excursion in Curaçao. * These excursions, which aren’t available to most passengers on your cruise, are guided by locals who take you deep into the culture to give you a more personal connection to the destination. Prepare to have your expectations exceeded as soon as you step on board the Celebrity Equinox. Enjoy craft beer and comfort food in the Gastrobar and sip refreshing frozen cocktails on the pool deck at Slush. Feel grass beneath your feet at the relaxing Lawn Club, a unique experience at sea. Every imaginable comfort, complimented by Celebrity’s unrivaled guest services, promises an unsurpassed cruise experience. George Town, Grand Cayman: Kayak along an endless stretch of coastline at Grand Cayman’s world-famous Seven-Mile Beach. Visit the Turtle Farm, an interactive nursery for green and hawksbill turtles, and have the once-in-a-lifetime experience of snorkeling with the stingrays at the Stingray City Sandbar. Or travel to Hell, a town with a name inspired by its odd rock formations. It’s a Grand Cayman must-see! Oranjestad, Aruba: You’ll notice the Dutch heritage on the independent island of Aruba in its architecture and the dialects of the residents. Famous for its palm-lined beaches and clear, calm waters, Aruba is perfect for swimming and sunbathing. One of the Caribbean’s largest shipwrecks, the 400-foot Antilla, is home to a wide diversity of sea life and is a popular snorkeling and diving destination. Willemstad, Curaçao: Some call Curaçao the Caribbean’s best kept secret. Enjoy your included “Heart of Curaçao” shore event. Sightseeing includes highlights of the island’s capital city, followed by a stop at the Jan Kok Plantation House, built in 1840 and one of the oldest houses on the island. The house is named after the 18th century slave master Jan Kok, who was infamous for his cruelty; many people on the island still believe that his bad spirit haunts the house. The plantation was mainly a salt plantation, although arable farming and cattle breeding took place as well. In 1860 about 100 slaves still worked there. Kralendijk, Bonaire: This island is surrounded by a Marine Park where the diving is excellent and a rainbow array of fish make it a perfect snorkeling site. Sorobon Beach is great for windsurfing and sunbathing. Bonaire is famous for its pink flamingos, which you can see along with other bird life in Washington Slagbaai National Park, and it is home to the Caribbean’s only barefoot casino. Key West, Florida: On the colorful island Ernest Hemingway called home, you can stop at the author’s museum, along with the “Southernmost Point in the Continental United States” and other Key West highlights, on the Conch Tour Train. Shop in Old Town, sample some key lime pie or visit the Key West Butterfly and Nature Conservatory, the quaint outdoor Key West Aquarium or the fascinating Shipwreck Museum. Call 855.645.2215 to Book Your Distinctive Voyages Cruise Today! *DISTINCTIVE VOYAGES TERMS & CONDITIONS:: Amenities listed apply only to the first and second passenger in an Oceanview cabin or higher on this sailing. Offers are subject to availability, at time of booking, and may be altered or withdrawn at any time without notice. Pricing will be confirmed at time of booking. Cancellations, refunds and penalties are imposed by the individual cruise line. Distinctive Voyages amenities are not guaranteed and may be substituted with a minimum number of guests, as determined by the cruise line, are not confirmed on any given departure. Combinability varies by cruise line. Exclusive Shore events vary by cruise line and are subject to change without notice. See complete Terms and Conditions. Great Vacation Destinations, Inc doing business as Bluegreen Travel Services, is located at 4960 Conference Way North Suite 100, Boca Raton, FL 33431. Great Vacation Destinations is an Iowa Seller of Travel No. 688, Washington Seller of Travel No. 602-283-711; Florida Airlines Reporting Corporation (ARC) registration No. 15-72225-4, California Seller of travel registration No. 2068362 (Registration as a Seller of Travel does not constitute approval by the State of California). Void where prohibited by law and where registration and/or licensing requirements have not been meet. In the event of a conflict between the Celebrity Cruises’ Details of Participation and Great Vacation Destinations’ Details of Participation, Celebrity Cruises’ Details of Participation shall govern.